- strange bedfellows, or inspired selection? Actually, they work together rather bloody well - a truly eclectic mix, 2+2=5, or something like that. Anyway, all four are crackers (geddit? ), we've been looking for an excuse to release them - and there's no better excuse than Christmas. FdM'ers will know Stay from their brilliant 3 track ep in 2008 (sold out, of course, even the videos have notched up about 40,000 views on youtube!) - having recently played The Cavern, they decided to take on a personal Beatles favourite and do that Spanish neo-psych/Oasis thing that we love; Permanent Clear Light, who you'll remember from their stand-out Who cover on 'A Phase We're Going Through', prove that classic UK pop + a strong Finnish accent go together like a stick of black pudding and a dollop of HP Fruity sauce - tasty. Hi-Fiction Science and Zeuk are new to FdM but they have each contributed some stunning and memorable - Hi-Fiction Science's version of the much-underated Third Ear Band track 'Fleance' builds from beautiful, delicate female vocals to a sustained rhythmic attack - a 6 minute epic, if ever there was one (there was, and this was it); Zeuk's 'Vision' has an intense fragility (no, i don't know what i'm talking about, thanks for pointing that out, but wait until you hear it) that more than does justice to Peter Hammill's original, with a haunting violin adding to the atmosphere. It could all add up to the best thing we've done so far. sorry, but you've missed the boat on this one! 'tis the season of joy, good cheer and festive vinyl offerings from Fruits de Mer Records - our first-ever FdM Annual! Remember the good old days, when Christmas meant a tangerine, a bag of nuts, a box full of chocolate bars with a cut-out-and-keep Val Doonican mask on the back (you had it lucky - Andy, the other half of FdM) and, best of all, your favourite comic in a classy hardback format; you know the kind of thing - Valiant, Victor, Whizzer & Chips, Bunty (oops, what a giveaway). - four great songs, lovingly recreated by four brilliant bands that treat the originals with the respect they deserve but aren't afraid to put their own mark on each one; from classic 60s psych to something that sounds remarkably like 2010 has finally arrived at Fruits de Mer (it has, but it knows its place). all for only $13, including postage and packing to anywhere in the world! 'Tomorrow Never Knows' is the final track of The Beatles' 1966 studio album 'Revolve'r but was the first to be recorded. Credited as a Lennon/McCartney song, it was written primarily by John Lennon. The song has a vocal put through a Leslie speaker cabinet (which was normally used as a loudspeaker for a Hammond organ). Tape loops prepared by Paul McCartney were mixed in and out of the Indian-inspired modal backing underpinned by Ringo Starr's irregular drum pattern (or so it says on Wikipedia). John Lennon wrote the song in January 1966, with lyrics adapted from the book The Psychedelic Experience: A Manual Based on the Tibetan Book of the Dead by Timothy Leary, Richard Alpert, and Ralph Metzner, which in turn was adapted from the Tibetan Book of the Dead. The title never actually appears in the song's lyrics; in an interview McCartney revealed that, like 'A Hard Day's Night', it was taken from one of Ringo's malapropisms. 'Wherewithal' ,by Clifford T Ward, appeared on his first album, 'Singer Songwriter', released in 1972 on Dandelion Records (the label formed by John Peel) just before it went into liquidation. As a result, the album received little media coverage and went largely unnoticed. Signing a new recording contract with Charisma Records, Ward went on to have a hit with the single 'Gaye'. It sold over a million copies worldwide and reached number 8 in the UK Singles Chart in June 1973. In 1984 Ward was diagnosed as having multiple sclerosis. He continued to record and write songs while living at home. He recorded his eleventh and what would be his last new album, 'Julia And Other New Stories', crawling on all fours into his home-based recording studio to finish it. In the winter of 2001, he died from pneumonia. 'Vision' was written by Peter Hammill, lead singer with Van der Graaf Generator (if he or they need any introduction). It was a track on 'Fool's Mate' (1971), Peter's first solo album, a set of 'orphaned' songs, written before and during the original Van der Graaf Generator days that simply did not fit the VdGG style (although all of the band members played on the album). 'Vision' was actually written by Peter in 1967, when he was 17. The Third Ear Band produced a soundtrack album to the 1971 Roman Polanski film 'The Tragedy of Macbeth', which they called,'Music from Macbeth'. A little-known, or cared-for, fact is that Keith Chegwin had one of his first film roles in this film, playing Fleance at the age of 14; 'Fleance' is the name of the track featured on this Fruits de Mer release - scary, or what? The Third Ear Band recorded their first session in 1968 for Ron Geesin which was released under the pseudonym of The National-Balkan Ensemble, on one side of a Standard Music Library disc. Their first actual album, Alchemy, was released on the EMI Harvest label in 1969, featuring John Peel playing Jew's Harp on one track; they also opened The Rolling Stones Free Concert at Hyde Park in July 1969. PERMANENT CLEAR LIGHT - a new band from Finland with a strong leaning towards psychedelia. Their recording debut was the very well received cover version of The Who's 'In the City' which appeared on the compilation album 'A Phase We're Going Through' (Fruits de Mer, 2010). STAY - an indie psych pop band from Barcelona formed in 2001. Influences range from madchester to The Byrds and CSN&Y, with Hammonds, sitar, theremin, Farfisa keyboard and moogs thrown in for excellent measure. 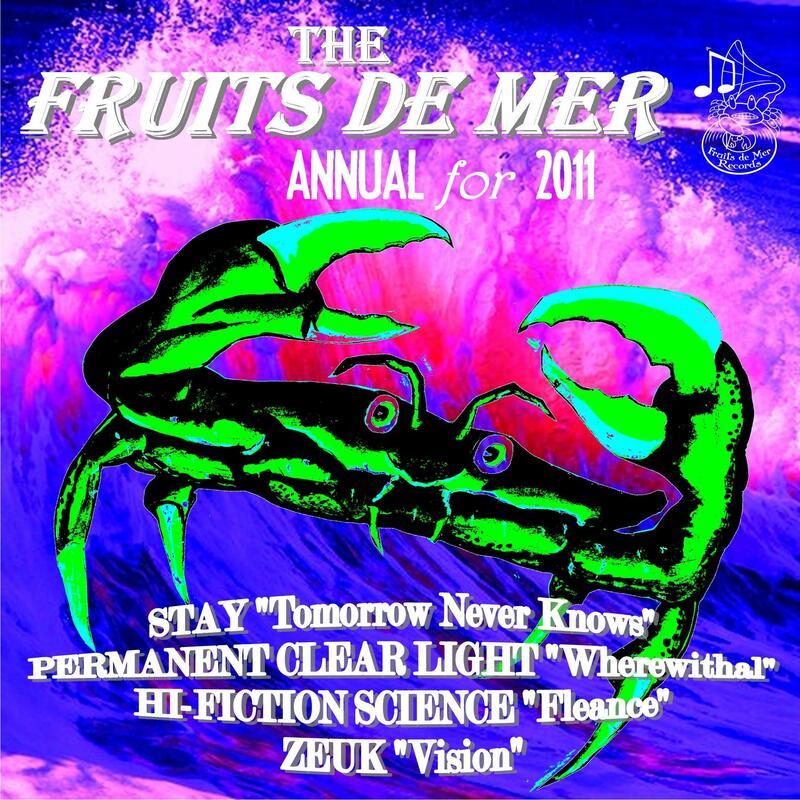 In December 08, Stay released a new work by Fruits de Mer that included classic tracks written by The Rolling Stones ('2,000 Light Years From Home'), Graham Nash ('Chicago') and the Strawberry Alarm Clock ('Rainy Day, Mushroom Pillow') – it sold out fast. They released their third LP 'Passport to Freedom' in early 2010 . Zeuk - a Cardiff based band delivering smouldering gothic folk. Noted for their mellow dramatic live performances, Zeuk have played alongside such luminaries as Mark Fry, Robin Williamson and Shelleyan Orphan, as well as at the legendary 'Fell Foot Wood' festival. Zeuk ventured into more experimental soundscapes when they played at the launch of Marc Roberts' recently launched book of poetry, 'Listen'. From whispered whimsy to full blown psych freakout, Zeuk offer an enchanting and unusual excursion; they are planning a 2011 ep/lp release. Hi-Fiction Science - rose from the ashes of masters of drone Suncoil Sect , in 2008. Early gigs in their native Bristol saw Hi-Fiction Science perform motorik, instrumental workouts with a nod to Neu! and Can. More recently the band have been collaborating with singer Maria Charles formerly with Bristol experimentalists Fuzz Against Junk. Hi-Fiction Science are currently recording tracks for a forthcoming album at Bristol's Toybox studios with Ali Chant (PJ Harvey/ John Parish / Warp etc). A review of early recorded material prompted Shindig magazine to cite HFS as a band to watch in 2010.